Yesterday, I sent out an SOS for my dining room. It was driving me insane. Couldn’t get it right. It wasn’t comfortable. It wasn’t right. (1) Empty the room and start fresh. (2) See if moving the buffet to the other wall and taking out the armoire changes the feel of the room. (3) Check Pinterest, Houzz, and Hometalk and see to which dining rooms I’m attracted and get some ideas. (4) Accept that I don’t like the table and that I made a mistake buying it (or at least that it’s not a permanent fixture here) and move on. And I have taken your advice! First, I stayed up on Sunday night thinking about this and I have accepted that this table is just not for me. I recognize and accept that, for the things that I got as gifts or bought just because it was a good deal (really only the table on that one) that really aren’t our style, I need to get rid of them. And I’m now ok with that. I didn’t sleep much on Sunday night coming to this conclusion, but I’m there and I’m ok with it. Second, I did what my friend Holly from Storywood Designs (you should check out her blog – she’s amazingly talented!) suggested and checked out Pinterest, etc. for what inspired me. What did I learn? (1) All the dining rooms I pinned or liked had rustic, rectangular tables. Farm tables. (2) All of the dining rooms had blue and/or green incorporated in them (not surprising, considering that I figured out recently that all rooms in our home have green in them). (3) Most of the rooms had brightly colored chairs – either painted or slipcovered in a bright color. Eclectic Dining Room design by Los Angeles Interior Designer Tommy Chambers Interiors, Inc.
(4) All of the rooms had neutral walls. (5) And, as you can see from images I pinned above, they all have funky, brightly colored art. Dear Husband is putting up with this – he gets that it’s a process. So that’s where I am right now. This morning, I am going to pack up the “stuff” I am keeping and move it to the guest room to get it out of there. I will also make a pile to donate or take to the furniture consignment store I like. I’m still taking advice on this SOS – please let me know what you think! Can’t wait to see how the room evolves! Love the inspiration pics you chose. I like them all, but I’m especially drawn to the art work in the first one and the table in the second! Like you, I’m continually drawn to farmhouse tables and bright art. Your room will be beautiful! Me, too! I love the art in the first one. Thank you! Hi Karen! Love your inspiration photos! You mentioned this before so maybe you’ve already started, but to modernize and freshen your room I would start by removing the chair rail and the curtains. You’re obviously drawn to pale wall color which will make the art work stand out. 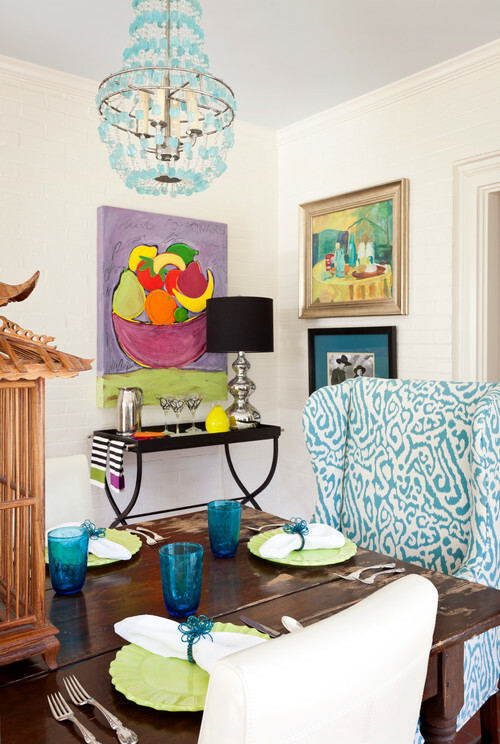 Also, you can always spray paint your existing chandelier a fun color to add some pop. Beautiful inspiration, Karen! Can’t wait to see the process & transformation!